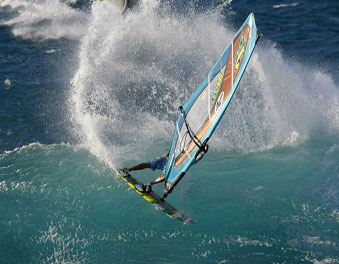 Madloop Windsurfing School and Windsurf Hire! Based on Lake Pupuke on Auckland’s North Shore, Madloop windsurfing centre and windsurf hire is Auckland’s biggest and best for windsurfing! Weather you’re a top-notch windsurfer or a completely newbie to windsurfing, Madloop windsurfing centre and windsurf hire is the place for all your windsurfing needs. If you're new to windsurfing or have always wanted to learn to windsurf, Madloop windsurfing school is the place for you. Madloop have been teaching people to windsurf since 1988 and we like to think that we’re the best! Madloop provide first-time, windsurfing lessons right through to hi-performance windsurfing lessons, focusing on carve jibing, water starts, freestyle and wave riding clinics. With our one-on-one windsurfing instruction, we promise to get you up and windsurfing in your first lesson and what's more we are the only school to teach six days a week in summer and winter. Stay in Touch with Meltemi Madloop!